Local Government Federal Credit Union earned the rank of No. 1 Credit Union in North Carolina, in Forbes magazine’s first-ever listing of the Best-In-State Banks and Credit Unions. 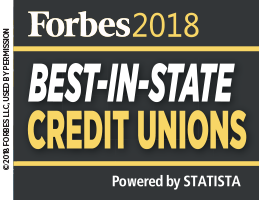 LGFCU earned an impressive score of 94.08 in the Forbes survey of more than 25,000 credit union members and bank customers across the U.S., who were asked to rank their current and former financial institutions on criteria including trust; terms and conditions; branch services; digital services; financial advice; and overall recommendations and satisfaction. In conducting its Best-In-State Banks and Credit Unions survey, Forbes noted the importance of customer service, accessibility and financial advice in an industry that has seen massive changes since the mid-1980s, including significant growth in online services. Overall, credit unions fared better than banks in the Forbes survey, with an average score of 80 compared to 75.2 for banks. Results of the survey were released in late June. Learn why members are so satisfied. Discover more of our story or find out how you can join LGFCU.